I think it's a poem I took up somewhere? But no, it's not connected to the map, I used them because the aesthetics fit with the region described by TheMG. Do you speak arabic? If so, I might call upon your help if needed sooner or later! i am arab but i grew up in the west, so i don't speak it myself yet, my wife is fluent though and i'm learning, i asked her if she could tell what it means and she couldn't becasue the arabic needs to be connected to mean something, if you recall the name of the poem i could probably find it written correctly. as for aesthetics, i understand completely, i've always head cannoned fire tongue as being arabic, i mostly just don't want people to make the mistake of using it incorrectly. the most reggretable situations is when i see people with unconnected arabic as tattoos, all you can do then is let out a sigh and say miskeen, unless im in a mood then i do laugh a bit. Going by the PM LeTipex sent me back when the map was fresh, it's not Arabic at all, but Malay, written using an Arabic script called Jawi. Ah I've not heard of that but very interesting, it makes sense that there would be a Malay script incorporating Arabic letters considering the majority of the worlds muslim population is south East Asian. 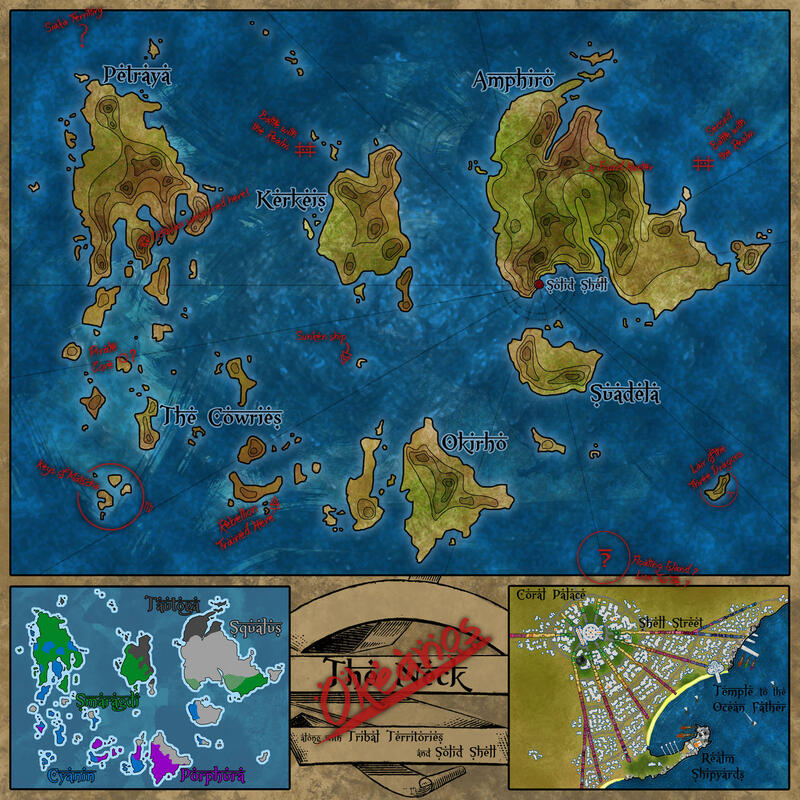 For TheCountAlucard, a map of the continent of Okenaos, raised from the bottom of the ocean and reborn into Creation. This is amazing and I never realized how much I wanted it until I saw it. For the islands I pulled from the sea? Still doing maps? I've been looking for a way to get a zoom of an area near Goldenseal, that I can work on. I really can't right now (I've got a few ongoing projects of my own, and I'm doing a complex map for Wise Old Guru). But I'll keep you posted as soon as I'm free! This is awesome. I am doing a campaign on the West, and would really like to use your archipielago and islands maps as a basis! As usual, click on the map to be carried away to deviantart, where you can dl the original file. How did you do the font for this? 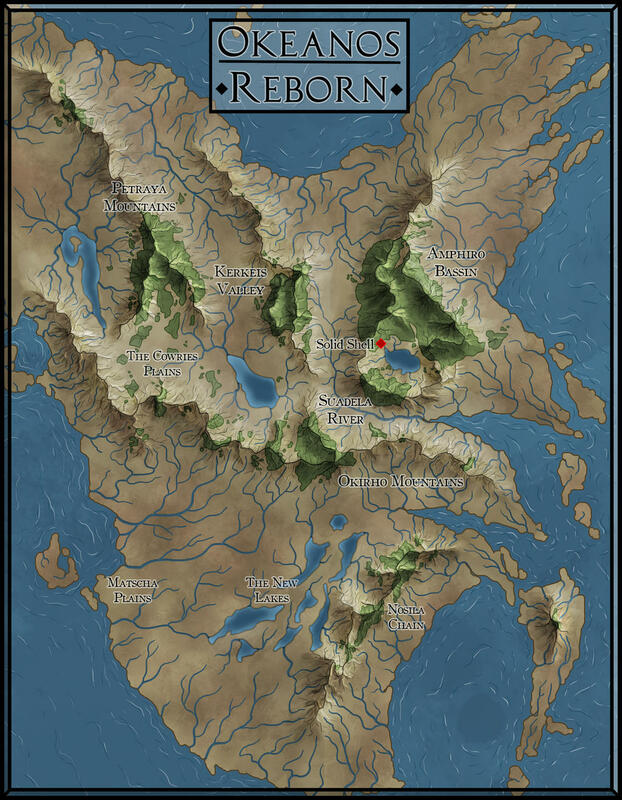 Also, I've finally worked out how to put pictures on this forum, so I kind of wanted to start a thread asking people to show off maps they'd made for their games. But then I saw this thread. LeTipex, would you like other people to put maps on this thread, or would you rather I made a new thread so you can just have yours on here? The two main fonts I used are XXII Arabian Onenightstand and Arabic Magic. You can find and download them on dafont (it's a hella good ressource), just follow the links! I'd rather keep this thread for my own maps I think? (I know I haven't posted in a while, but... work and life and health being what they are, I've had precious few free time to work on maps in the past year, alas, except for quick sketches) I would love to be linked if you end up opening such a thread tho. As for how I do it... I usually start by doing a quick sketch on paper, followed by a first linework that I scan. The rest (color, details, names and decorations) I do on photoshop. There are nice brushes lying around the net (the ones I had a bit of fun with are StarRaven's Sketchy Cartography), but your work ends up looking a bit samey if you keep on using them, so the more I work on it, the more I end up doing things by hand. The very best tutorials I've seen are either done by Djeskspek's on deviantart, on Jonathan Robert's blog (the official cartographer for Game of Thrones), or on the cartographer's guild forum if you need really specific and technical tips. I just want to pop in again and say how much my group loves the Okeanos map. I'm waiting to surprise them with the "Reborn" one until a certain story arc resolves.